OCT 15 14 – 12:30 PM — In the professional kitchen, as at other disciplined environments, you can tell who’s motivated and stands out by the way they handle themselves at work stations and in their inter-personal relations. That’s what struck me some five years ago during one of those periodic cooking contests involving students and/or professionals at the Algonquin College culinary arts program, where I occasionally sat on a panel to judge the work of competitors. There, contestants are graded not only on the creativity and execution of their final dish using key mandatory ingredients, but on how they conduct themselves as they go about their tasks. The last bit is significant, as I know that chef Russ Weir, formerly at the Sheraton Ottawa and now executive chef in charge of food services at the college, has often told me he looks at how up-and-coming students handle themselves when they think no one is watching. The motivated student who cleans his work station between jobs, who offers to help others, and who generally keeps himself (or herself) busy without being told is more often than not the one employers are looking to recruit for their own kitchens. You can study all the recipes you want and learn no end of culinary theory in textbooks, but what separates true talent and potential from a multitude of others is someone who demonstrates passion, motivation and drive to try new things (and, yes, make mistakes). And so I was impressed in 2009 when a young competitor, second-year Algonquin student Jason Groulx, was the only one among a handful of competitors who made a point of extending his hand of introduction to judges — then went about his work with singular focus. That’s what sticks out in my mind about Groulx (as I can honestly say I do not recall what exactly he presented as his final dish). Over the years I bumped in to Groulx again and again, frequently at Juniper Kitchen & Wine Bar (2009-11) while he was learning under owner/chefs Richard Nigro, Norm Aitken and Peter Robblee. 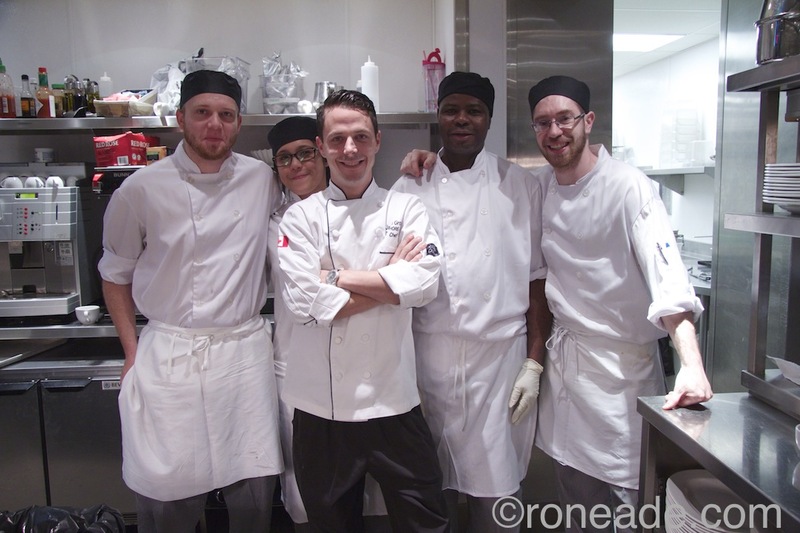 He’s had other work experience, of course, but I was only too delighted — and not at all surprised — to see him move from restaurant chef at the Hyatt Regency in Montreal (2011-12) to sous chef at El Meson in Ottawa (2012-13) and, most recently, the prestigious high-end steak and seafood Shore Club that opened in 2010 on the ground floor of the Westin Ottawa. 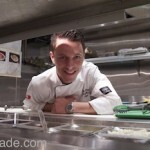 After serving as sous chef at Shore Club (March 2013 to February 2014), he was appointed executive chef early this year. Raised in Barrhaven, the former student of Mother Teresa High School, now with life partner Allyson Browning and their two young children, is running a major upscale kitchen at the ripe young age of just 28 years. I caught up with Jason in mid-September for a long-overdue interview about his bright career and what motivates him. And, as is my wont, I picked his brains for advice he might share with young people entering the trade. I think his insights are valuable, especially for those with aspiration. What follows is my (slightly edited) interview. 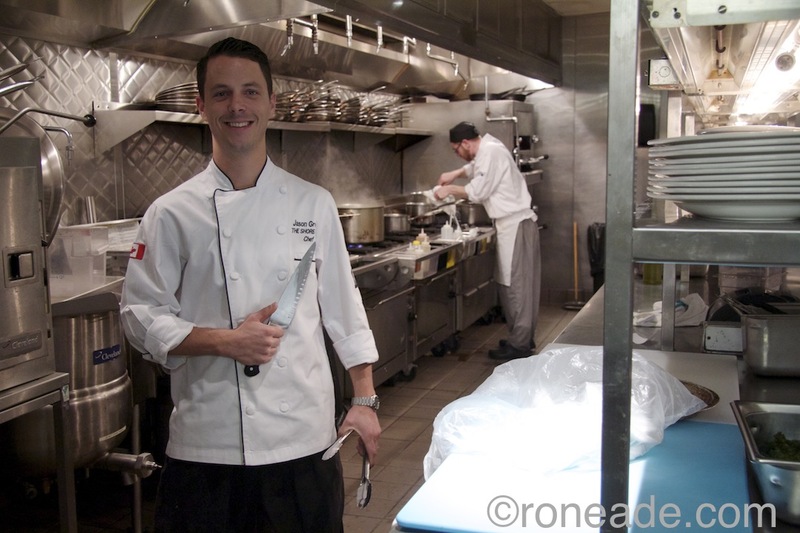 Ron Eade: You’ve had a meteoric rise in your career, holding various positions since graduating from the culinary program at Algonquin College in 2009, most recently appointed sous chef at The Shore Club in March 2013, then executive chef last February. Jason Groulx: You know what? Just cooking at a young age, always wanting to be around food and helping my parents where I could since I was about eight years old. Even then I knew I wanted to be a chef, and when I turned 14 I got into Kelsey’s opening in Barrhaven, which was my first chance in a kitchen. I liked that adrenalin, I liked that rush. It’s not a slow process – you’re in the middle of everything and people are going to be trying your food right away. 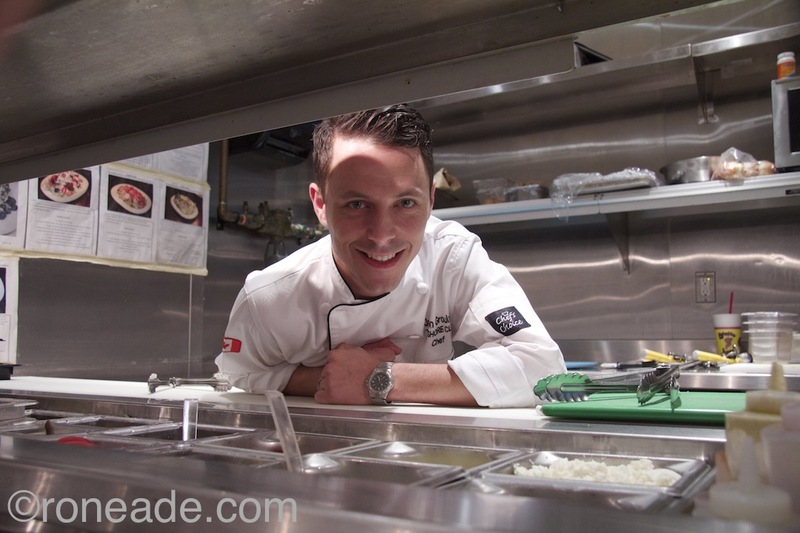 Eade: I think your career path could be a lesson for other up-and-coming chefs. What do you attribute this quick advancement to? Groulx: I’ve always said, and I tell my cooks today, that to be where I am today I’ve always done things that others didn’t want to do. So when it’s cleaning or some of the less-fun work, I was there. I’ve always got in there without the chef having to ask me. You have to have the passion, the fire in the belly, and I just kept walking through doors that were opening for me. The work is huge and you have to keep connected, even if it’s a five-minute phone call with a chef you met somewhere. I’ve had doors open because I’ve always been connected with what’s happening around me. You have to have one goal in mind and just keep moving forward and work hard. It’s as simple as that. Eade: Anyone can learn to cook from textbooks and recipes. 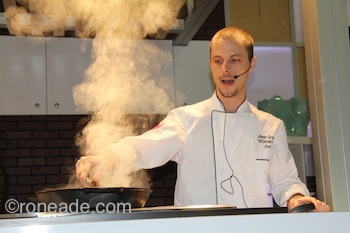 What do you feel is the main characteristic of a successful chef? Groulx: Presence. Motivation. You have to motivate people. Anybody can cook, right? You have good cooks and you have good chefs, and you have to have balance. A good chef is someone who is a leader, guiding and coaching people and taking them under your wing. You make them excited about what they are doing so they can do their best. It’s great to be a good cook and some people may never understand how to be a chef. You have to open your mind and watch everything happening around them. 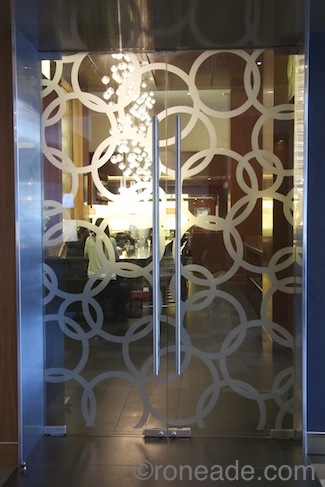 Eade: You have already had impressive experience managing day-to-day operations of a busy, if not iconic restaurant. What qualities do you look for in candidates who apply for work at your establishment? Groulx: Number one, passion. You can’t teach somebody passion. When people walk in the door you notice how they talk about their experiences and you can tell right away how they feel inside. That’s huge, because you want to have them come in every day and be happy about what they’re doing. Confidence. Even if you don’t know much, being confident about where you want to be is important. You may not know everything, but you’re here to learn. I like to bring people in for a stage (brief internship) and just watch them. For some it’s almost natural, for others it looks like they shouldn’t be in a kitchen. Eade: In your mind, what makes a candidate for your kitchen stand out from others? Groulx: The confidence, passion. Are they confident as they walk around? How do they carry themselves? If you’re confident and passionate but you don’t know much, I can teach you a lot. But if you’re not confident and always nervous about making mistakes, you can see that. When you’re confident then you want to get to that next task and keep moving fast, kinda like how I was. Not knowing a lot doesn’t make someone a bad cook, it just means I can teach them more and give them the guidance they need. I don’t really worry about technique, I look for dedication to the career. You look for the self-starter: Are they just standing around between tasks, or are they always doing something or trying to help someone? Eade: What misconceptions do some young people have about cheffing as they leave their formal training for the working world? Groulx: Some think they’re going to be paid a lot right off the bat. Kids coming out of school may think they know a lot, as I did when I left school. But you realize you really don’t know a lot at all. Some may feel almost entitled, although there are many who are not like that. Some do not understand what it takes to rise to where you want to be, the amount of work involved. Learning from books will not teach you the pain you’re going to go through to get to where you want to be. When your friends are out partying or on birthdays, whatever, you’re at work cooking for them. Get used to that reality. It’s hard on relationships, and your partner has to understand the long hours and shifts you’ll be working. I’m usually here at 9:30 a.m. until about 11 p.m. five days a week. I try to take off two days a week, and I’m lucky to have a strong sous chef in Shawn Marsh, who used to be my chef, my boss, at Juniper. At Juniper I really learned how to cook under pressure. There’s a lot more to running a private restaurant than you think. My standards were created at Juniper, and I realized that owning your own place is not easy. It’s a lot of fun, but a lot of work also. Eade: To what extent do popular food television shows have an influence on candidates you see looking for work? Groulx: Some people may think it’s a lot easier than it is. When they see a half-our segment on TV, it’s quick. But when you come into a kitchen you have to be able to focus. If it’s a competition or black box on TV then you’re not really cooking for guests, but here people are paying for their food and you have to focus and put in long hours. The kitchen is hot, it’s sweaty, you may be tired. You have to perform consistently. Eade: How has food television influenced you? Groulx: I like getting ideas from it. I’ve done TV at Rogers and segments on breakfast television, and being on television teaches you how to work fast and remain calm. You have to be able to perform, to chat, and look good. Eade: What are the wrong messages you see in food television these days? Groulx: People may think it’s fun all the time, you can run to a cart and pick your food. But I don’t think food TV is actually trying to send out a wrong message, it’s just not as easy as it may appear. Real life is serious, it’s no joke, and there’s a lot more pressure day after day than what you see on TV. Eade: What do you see as positive messages in food television? Groulx: It excites people, gets people interested, and it gives people confidence that maybe they can cook. Eade: Do some chefs really yell and scream at subordinates as we sometimes see on popular television shows? What is the reality? Groulx: Yes, some do yell, but I don’t believe in yelling. Everyone will lose it at some point, but my job is to be consistent and control my emotions no matter what happens. I know my guys will make mistakes, but I don’t want to yell because I think that will create a trust issue between us. Eade: Do you ever see yourself as host or star of your own television show? Does television even interest you? Groulx: I like television, I think it’s fun, but I’m living in the moment right now. It’s a difficult position, there’s a lot of pressure, there is labour to manage and my menu is huge. My job is to make sure everybody is doing their job. Do I think about the future? I think the future will be great. Do I know where it’s going to take me? Well, I know I want to do this and I have to focus on right now. 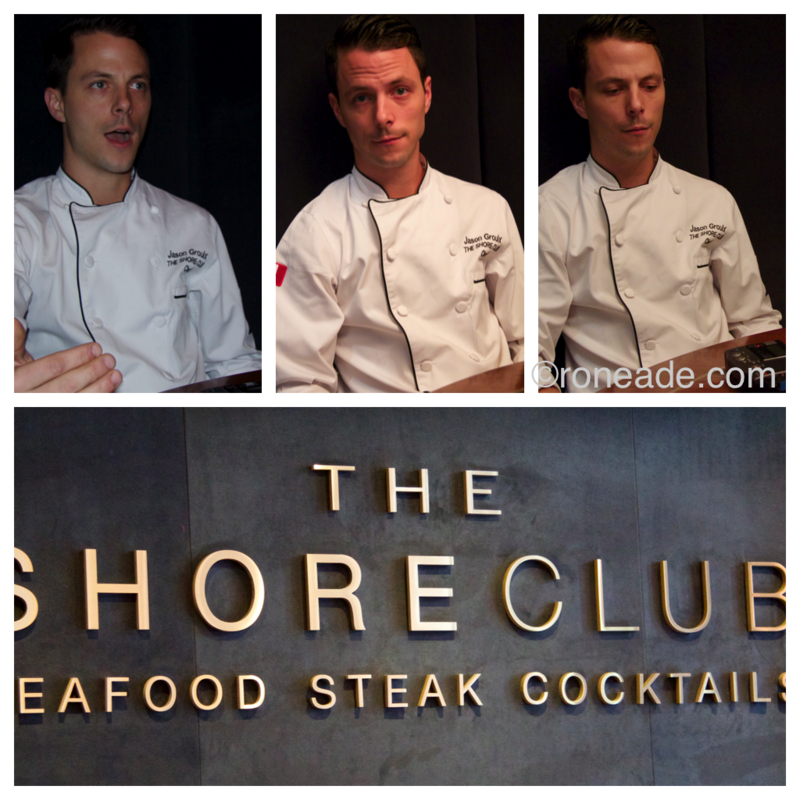 Eade: The Shore Club has an established style and cuisine. Are you able to be creative in this format? Groulx: I’m asked that a lot. I can put on as many features as I want, but our main menu doesn’t change. The features are where I can change. Right now we’re doing a meat and fish feature, whatever I want, now a short rib and scallops together. Then we have pan-seared Arctic char and prawns, those are our two features. We have three or four types of oysters I get to choose, as well as the fresh fish. And the lunch fixed price Monday to Friday changes every week. I can change features daily, or every two or three days, then we have seasonal side dishes I can change at any time. Eade: Do you have much opportunity at The Shore Club to promote and use local, seasonal ingredients? Groulx: Yes. I use seasonal ingredients on my feature sheet; I have farmers bringing me local items … but that’s not the entire selection. I have to have, say, asparagus in winter because that’s on the main menu, but I ensure it’s good and tastes great. Those are the standards and expectations, which can be a challenge to sustain. Eade: What are the up-and-coming food trends you see in the hospitality industry? The super foods. People love kale, it’s huge. Right now I have seasonal and sautéed kale on the menu with shallots, white wine. Healthy foods, getting away from butter and using more olive oil and canola. People may have a gluten allergy, which may or may not be true – but who am I to decide? We want to make sure the guests are happy. People are eating smarter, but they come in and still want a good meal. When people come to any restaurant they don’t want to have OK food, they want to leave saying ‘how did you make it taste so good?’ And that’s where you use different techniques on seasonings with salt, acidic components that will give your food an added dimension. I don’t want just OK food, I want it to consistently pop. Eade: How does your generation of younger chefs differ from others who may have been in the business many years? Groulx: I think older chefs can be a bit more strict, and that’s OK. We can learn from that. But adaptation is important. We’re always moving, this business is always fast-paced and we need to adapt and go with the flow. Eade: Any other parting words of advice for young people entering the career? Groulx: Absolutely. Work hard, have a passion. Not everyone in this world has to have passion, but in the food business if you want to succeed you need passion to push yourself farther. Work hard, be confident and have passion. If you don’t have passion, then what’s the point? And maintain your network. People you meet along the way, keep close to you. Call them, drop by and visit them.